Jones’ Gallery of Art is hitherto unrecorded as a silhouette studio and only a couple of examples of their work has previously been noted including a profile of a lady with a dog that was sold by a London salesroom many years ago. So to discover two further profiles that are clearly a pair, albeit that only one of them is stamped, is an opportunity to study the characteristics of the artist’s style and so perhaps enable other unmarked profiles to be reliably attributed to the Gallery. Like the other known (but unseen) Jones’ Gallery silhouettes, these are full-length and are cut-outs that have been laid on standard weight card. They have been extensively gilded, the embellishment on the lady being particularly bright. The brushstrokes are not though as fine and neat as, for example, those seen on work by the Royal Victoria Gallery. The lady’s hands are rather naively painted but then so many artists found hands difficult to capture. The problem is neatly avoided with the gentleman whose hands are clasped unseen behind his back. 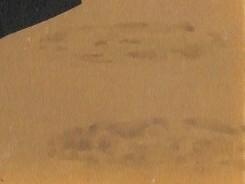 The background on both is also painted in sepia circles to convey a carpeted interior; this may well be a recurrent Gallery motif. The profiles are undated but the style of the lady’s dress and hair dates them to about 1830. Only one of the pair – the lady – is marked with the Gallery stencil stamp. No place is connected with the Gallery though one of the previously known examples is apparently inscribed Tunbridge Wells. 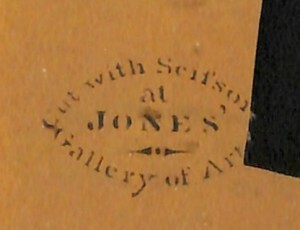 The use of such a stamp, as well as the form of name, suggests that Jones was a commercial artist most likely itinerant though the paucity of marked work hints that it was perhaps a short-lived venture.